After John Lennon died, Paul McCartney re-released Beatles songs. Without notice or explanation, he changed the credits from “Lennon/McCartney" to “McCartney/ Lennon". Such pettiness was unexpected from an entertainer already a legend, but this is how desperate people are to claim the status of frontman. To be seen as THE person responsible for the band, not grouped with those in the back. You see, though Lennon and McCartney are credited with creating The Beatles’ sound, there is actually little virtuosity in their playing. It isn’t easy to think of moments where either man shines as a musician. The Bach-style piano solo at the end of In My Life, for instance, was played by their producer George Martin. Musically the two most interesting Beatles songs were both written by George Harrison. They are Something and Here Comes the Sun. Something because of its double melody and double mood, at first surrendering, but then suddenly defiant, with a military drumbeat. Here Comes the Sun because of the unexpected chordal run Harrison unpacks at the back of the song. Carl Sagan thought it was so good he wanted to send the recording on Voyager with Bach’s Brandenburg Concerto and Kesarbai Kerkar’s Bhairavi. This was appropriate because Here Comes the Sun is set in the same mood as Bhairavi, a morning raga. But The Beatles’ record company acted pettily. And so Chuck Berry’s Johnny B. Goode went into space instead, to tell the void what Man is capable of. Because he experimented, Harrison also made mistakes. What rubbish Within You, Without You from Sgt Pepper is. Based on his interpretation of Khamaj, it is neither within one nor without. But when it worked out, Harrison’s work was above the fray. Another example is the strange, hypnotic song he wrote for Cream, called Badge. We are familiar with Candle in the Wind, the song Elton John sang in remembrance of first Marilyn Monroe and later Diana, princess of Wales. The key element of the song is its moving lyric, but that is not the contribution of Elton John, who merely set it to music. The song was written by Bernie Taupin, who has written all of Elton John’s hits but is known little. He is a fine poet, having also written Don’t Let the Sun Go Down on Me, but few would associate that song with him either. Guitar players will immediately register that the quality end of the The Police’s music comes from Andy Summers. 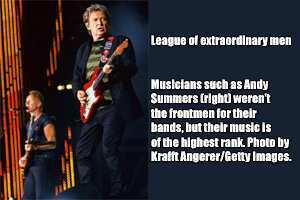 Sting is deservedly the hero of the band because he wrote most of the songs, but Summers is a musician of the highest rank. His fragmented playing is unique, and as original a sound as that of two other great British guitar players, Mark Knopfler and David Gilmour. A relatively short man, his hand spanned five frets as he played Every Breath You Take and Message in a Bottle. The Police’s drummer, Stewart Copeland, the son of a CIA spy, was also one of the best musicians of his kind. However, since he wrote none of The Police’s songs, he made no money from anything other than touring. These days he composes background scores to movies, far from the global hero that Sting is. Other musicians who did not write and needed to play concerts constantly to make a living are The Rolling Stones’ Bill Wyman and Ronnie Wood. Neither man is a particularly good musician, but one who is and is outshone by Mick Jagger is Keith Richards. A great craftsman and a modest man, Richards deserved to play for a better singer than Jagger. Often a band has a frontman who is better in the back, for instance Pete Townshend of The Who. It is embarrassing to watch Townshend trying to play a solo. A bird on the run flapping hard but unable to lift off let alone soar. But he led the band, ahead of technical players like his bassist John Entwistle. I know something about playing behind the frontman. For six years between 1989 and 1994, I played guitar with a band in Surat. It was led by Rajiv Desai, a handsome and charismatic musician who drank himself to death at 39. We practised every afternoon at the mill Rajiv’s family then owned, Paradise Prints. Because the Desais were wealthy, passing musicians often stayed with them. One afternoon, this must have been in 1993 or so, the studio was occupied, and a bearded man was tuning a many-stringed guitar. It was Vishwa Mohan Bhatt, and he had just won a Grammy Award for a record called A Meeting by the River. Bhatt had partnered with Ry Cooder, but had actually never heard their winning record. This was, he told Rajiv, because he did not have a CD player. Rajiv did, and that was apparently the first time Bhatt heard the album recorded spontaneously at an American church after midnight. A producer called Kavichandran Alexander convinced the two guitarists to play together, and Bhatt came after playing at a concert. Cooder went on to make another famous record with Cuban musicians, but Bhatt did not get much out of the Grammy and remains in the shadows. A Meeting by the River is seen as a Cooder-fronted record, but this isn’t because of Cooder. After the win, Cooder gave an interview to Guitar Player magazine. Explaining the 14-hour practice discipline of Hindustani players, Cooder said few guitarists in the West could match Bhatt. Speaking of speed, he said players like Steve Vai and Joe Satriani should observe Bhatt’s technique: “If they saw up close what he did, they would fall out." The frontman then said that despite playing together Bhatt probably did not know who Cooder was. “He thinks I’m a player of nursery rhymes," said Cooder, “Mr Rogers or something." I like bands like Bandra’s Shankar-Ehsaan-Loy. Other than the national integration appeal of their name—something I am quite attracted to—there’s the matter of their seemingly equal status. They appear in advertisements and shows together. Who writes their hit melodies? Who scores the music? Shankar Mahadevan the singer? Guitarist Ehsaan Noorani (whose beautiful black Fender Stratocaster I bought many years ago)? Could it be the quiet pianist Loy Mendonsa? Each in turn? Tough to say. They’re bound together, an indivisible unit—a band in the original sense of the word. Aakar Patel is a director will Hill Road Media.